The couple we honor tonight has been very active in the Square Dance movement for over forty years. 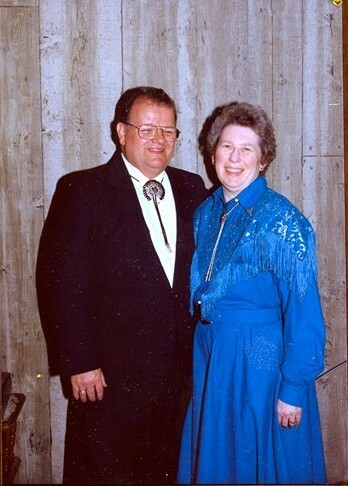 LEN & CONNIE HOULE started square dancing in 1964 with the Sparkling Spinners and the Paper City Squares. They also started Round Dancing with The Happy Pairs and are still active participants in several square and round dance clubs. Len and Connie have held many local, regional and national officers. They served as Co­ordinators, Class Chairman and Presidents of the Vagabond Square Dance Club. In 1982 Len & Connie started a pre-teen club, The Barnyard Bunch, and were advisors from 1982-1988. Len and Connie belong to the Bay State Travelers Camping Club and have been Secretaries, Vice-Chairman and Chairman of this organization. Len and Connie were founding members of the Western Massachusetts Co-Op Committee and served as Treasurers and Chairman. They created the Distinguished Service Award in 1979 and received this award in 1990. Len and Connie have been Chairman of the Western Mass. Fall Festival, and organized and ran the Square Dance booth at the Eastern States Exposition for ten years. The American Heritage Dance Team which performed at many venues for nine years was another of their creations. Len and Connie have been on the board of EDSARDA (Eastern District Square and Round Dance Association) since 1984 and have been Secretaries and Chairman of this organization. They were General Chairman of the 1991 New England Square and Round Dance Convention, held in Springfield Massachusetts, and have been actively involved as advisors for the 2006-2007 Conventions. The Houles also were Security and Halls Chairman at the 2002-2003 Conventions held in Sturbridge, Massachusetts. Len and Connie have been secretaries of the New England Co-operation Committee since the year 2000 and are Eastern Region Vice-Presidents of the United Square Dancers of America. Len and Connie are actively involved in the Square Dance Foundation of New England and were inducted into the Foundations Hall of Fame in 1998. The Co-operation Committee, acting on behalf of the Square Dancers of New England, is proud to present this award to LEN & CONNIE HOULE.